I’m happy to report that the Words For Warriors Project is underway in earnest. I have gotten some great submissions from a wide variety of people who wanted to express their support for our military men and women. There are now submissions from a great-grandmother, a teenager, a ten year old, a veteran, a newly minted American citizen, a couple of attorneys, a retired toolmaker and a worker in a nail shop. It’s gratifying to see such a lovely array of participants. I am starting to reach out into the larger community. I have composed a letter explaining the Words For Warriors Project which I will send to local churches to see if there are members of their congregations who might like to participate. Those letters will be going out tomorrow. I have a couple of meetings set up this month, one with a veteran’s group at a large manufacturing plant and one with a single veteran who may have advice/suggestions for connecting with more people and for places for distribution once I have enough submissions to bind. If you’ve already made a submission, I thank you from the bottom of my heart. If you haven’t, won’t you please take 15 minutes, jot a note and send it along to words4warriors1@gmail.com? As always, I appreciate your help spreading the word. The more submissions we get, the better! 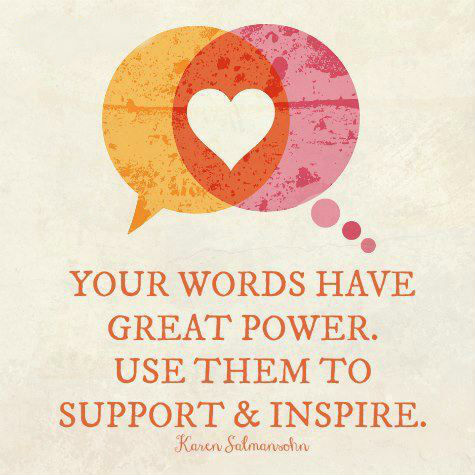 Remember a simple kind word can be a very powerful thing!